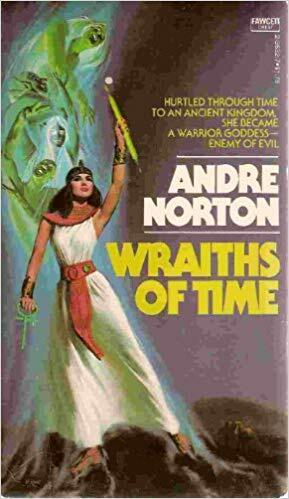 Andre Norton’s classic Wraiths of Time is classified as Science Fiction on the cover – “science fiction at its best” (The Portland Oregonian) – but in fact, like most of her work, it is cross-genre: Speculative Fiction (there are dreams, possibilities, conceivables, but little science) and Fantasy (her books are pervaded by magic, and in any contrast between magic and technology magic will always win). Actually, I chose this particular book to review here because it was the first Time Travel story I ever read and I have been hooked on Time Travel and Time-slip stories, a whole sub-genre of SF and Fantasy, ever since. Tallahassee Mitford, a modern American with attitude and a PhD, is suddenly transported from the museum where she works as an assistant to the Head of the African Division to ancient Egypt, and finds the ankh she had been holding still there in her hand when she wakes up on the hot sand with a dead woman, the image of herself, lying beside her. But now an invader from another time or space – or another space-time continuum – had arrived. Just one man, known as Khasti, but with the aid of his vastly superior technology he was quickly taking over the country. Who was he? Where was he from? Was he really alone? If so, why? Tallahassee, marooned there in that world, finds herself cast as Ashake, who is one of the few people left with the Knowledge, the Power. She is also, as it happens, the heir to the throne of the Candace. And before the question of how – and whether – to return to her own world arises. she must play a pivotal role in the battle between magic and technology, between good and evil. Is magic always good, technology always evil? Ah, what a question.